The improvisational piecing panels swam to the top of the nearest pile in the sewing room, so I finished the quilt. I knew I wanted to do something with the raw edges of the panels, so in the true spirit of improvisational art I used what was at hand. Some thick embroidery thread and beads left from another project either had to go in the very next project or be put away. You don’t need to be psychic to guess what I did. I’m pleased with the quilt, but I do wish I knew why this one worked and other improv pieces I’ve tried didn’t. Perhaps the stars were in alignment, perhaps I’m honing in my signature color palette, perhaps I like it because people I’ve shown it to like it. Fortunately, I have lots more scraps for more experiments. There is something about embroidery that turns my fingers into a (nearly) perpetual motion machine. The top for On To Africa needed more embellishment, so I started adding a few lines of embroidery here and there. Before I knew it, the journey to a quilting-ready top was finished. One side of the top is more heavily embroidered than the rest, but I’m okay with that. Most of this work was done by another artist (and I still don’t know who – none of my friends remember where I got the blocks either), and I’m perfectly content to let her work get all the attention. I first thought I would leave the center appliqued panel alone, and fill in the open space with quilting. Then I realized the jacquard will absorb all the quilting, so I might as well embroider the living daylights out of it. Shameless self-promotion alert, embroidery on the journey into space is a pivotal plot point in The Chenille Ultimatum. If you need a good giggle, give the book a try. Two projects that I thought were clear in my mind wandered away from me this week. One changed direction radically, the other – my Challenge Group project – not so much. The Challenge assignment was to make one quilt with either two different colors and three different shapes or three different colors and two different shapes. I started with purple and black, because those were the first scraps I pulled out of the bin. I noticed that one of the black fabrics had pink flamingos on it. “Self,” I said, “you will have to decide if that pink is going to count as a third color.” By the time I finished, I realized that with clever embellishment, the flamingo could be both a color and a shape. The painted square above the rows probably will not make the final cut for this project. I’ll show you more as the quilt tells me where it wants to go. My grandmother used to say it was nothing for one woman to cook for fifty people. Trouble was, she cooked for fifty even when she was serving five, and her food was so delicious we five would eat as if we were fifty (and starving). I guess I learned the overkill lesson a little too well, because I took along three projects when I demonstrated quilting at the county fair last week, and only worked on one. At least I finished the embellishment part of the project at the fair. I will use a facing rather than a binding for this abstract forest floor. I didn’t get a chance to start the piece I intend to turn into an impressionist landscape until later in the week. As I suspected, the paint on this fabric is really stiff. I started beading the sections that look like flower beds with the idea of embroidering leaves and vines later. The leaves and vines might have to be sketched in with a permanent marker. I am beading and stipling through the fabric and a layer of batting. I will probably finish the piece with a Laura Wasilowski technique, demonstrated in this tutorial. She is as wonderful a teacher of fiber art as my grandmother was a teacher of cooking. I hope you are also fortunate enough to be able to learn from the best. I unearthed more felt in my studio. I have no idea when – or why – I bought it. Still, it’s in my possession so I figure I should turn it into a project. My other felt patches worked pretty well, so I decided to go smaller and use up some of my button collection with this latest experiment. This is a great project to sew while watching TV. If you have a bunch of precut squares and leftover floss, you can keep your fingers occupied through many a binge-watching session. I had a supply of 2” strips, so I cut the first felt square 2 ½ inches, the second 3 inches. These little patches can be attached to tote bags, pillows, quilts, dog collars, baseball hats, whatever you have around that cries out for embellishment. If you decide to make some, send me a picture of where they end up. We could start our little journey of the traveling patches. And you thought I meant fabric with flowers and trees. No, this is actually some plastic-y non-woven material that bills itself as a plant and seed blanket. My husband bought it at our local Orchard Supply Hardware store, but for some reason I can only find an online link at Amazon. He gave me a leftover chunk and asked if I thought I could use it for a quilt. The material is nubbly, like an iron-on interfacing, so it grabs hold and won’t shift during sewing. I sprinkled sequins and seed beads over the background and quilted them in place. While the material is as transparent as a tulle or netting, it won’t allow the small beads to slip through the holes. It also shimmers, making it a good candidate for water effects. You can make reasonably clean cuts close to the stitching line. I have no idea how long this material will hold up, nor what it will do to the cotton underneath it. That’s part of this experiment. Still and all, it’s fun to play with. The first of the holiday miracles occurred this week. I finished the beading-projects-in-progress. The shy little orange piece finally told me what it wanted. I considered making more tassels, but then I saw some other large beads and knew that less would be more with something that measures only 4″ x 6″. The less is more school of beading worked for the green stripe piece too. I added a few extra lines of embroidery after I did the running stitch around the edge and called it good. The piece begged for minimalist embroidery. I used a turquoise silk ribbon. This is my first foray into silk ribbon embroidery, but definitely won’t be the last. This piece really kept its wishes hidden. I put on the two small gold beads, waited a day, beaded the lines with the large wooden blue beads, waited a day, and attached the bronze rectangle. By that time I was done listening to the piece. A double row of running stitches seemed sufficient. My holiday wish for you is that all your projects go well throughout the season. I’m guessing I was a druid in a past life. Or an oak. I could have been an oak. At any rate, my connection to trees is powerful. Like the Doctor and a fez, I can’t just walk past a tree. I bought this necklace at the Livermore Art Association Spring Show. 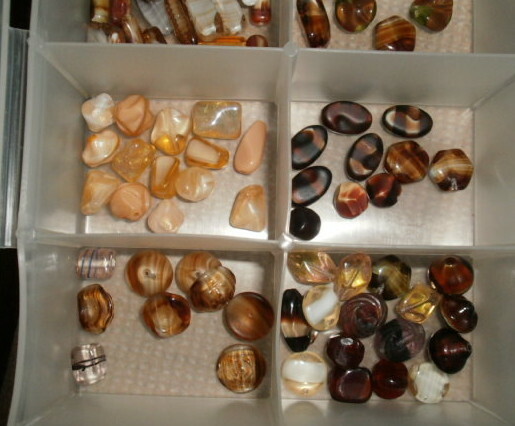 Not only is it stunning, it gives me some great ideas for using my larger beads. Leaves for an autumn tree? 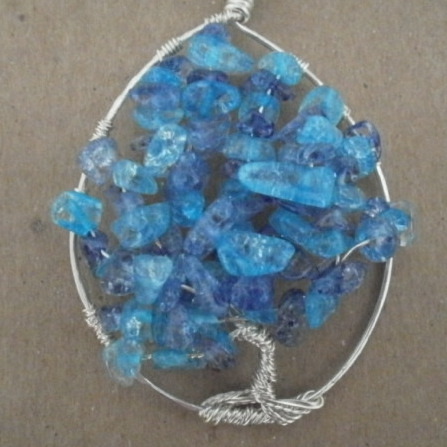 My wire skills are minimal, but I can make tree trunks for art quilts with ribbons, or maybe smaller beads. I have more inspiration for tree work than time to create. The necklace is just the latest addition to a growing collection of jewelry, art, and photos about trees. If all else fails, I can always take a walk and admire the many lovely trees in my neighborhood. 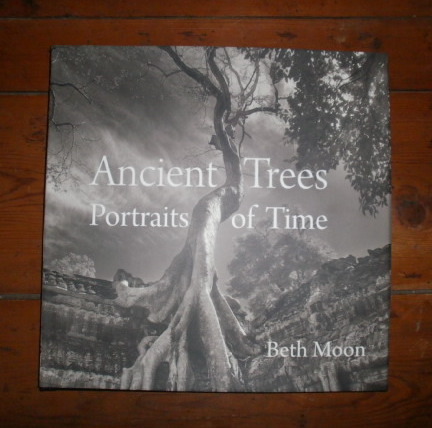 If you are looking for inspiration from trees for your work, check out Ancient Trees: Portraits of Time by Beth Moon. Beth Moon has an amazing eye, and Abbeville Press created a worthy volume for her talent.